In an open letter to law enforcement, Ferguson wrote that he was confident the wide-ranging law was constitutional and would withstand court challenges, but that he was concerned about threats — mostly from county sheriffs — to not enforce the new law. 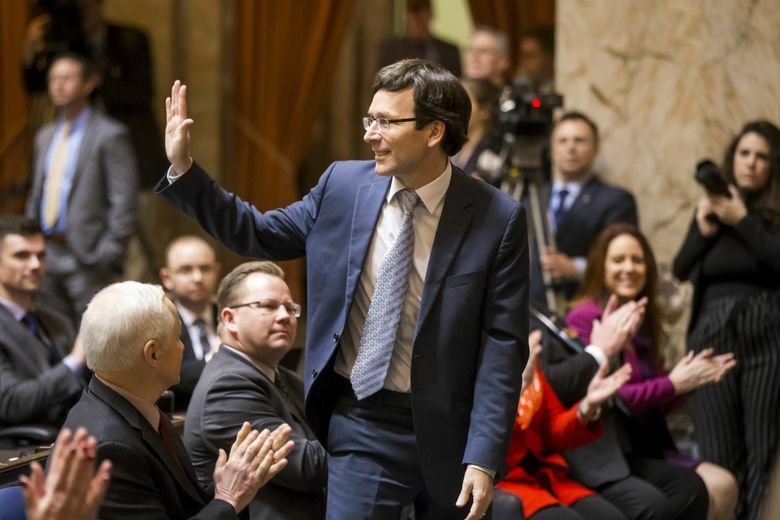 County sheriffs who say they won’t enforce Washington’s new, stricter gun laws could be held liable if they refuse to perform enhanced background checks and someone who shouldn’t buy a gun is able to buy one and uses it in a crime, Washington Attorney General Bob Ferguson said on Tuesday. At least 13 county sheriffs have said they won’t enforce the law, Initiative 1639, which voters passed by a wide margin in November. Most of the new law — which raises the minimum age to buy semi-automatic rifles, requires enhanced background checks for those rifles and can hold gun owners responsible if their gun was stored carelessly and is used in a crime — has not yet gone into effect. Only the higher age limit — raised from 18 to 21 — is now in effect; the rest of the law goes into effect July 1. In November, the NRA and the Second Amendment Foundation sued Ferguson and the state of Washington in federal court, arguing the law was unconstitutional. The lawsuit was withdrawn on Monday, after Ferguson sought to have it dismissed on procedural grounds. But the lawsuit was simultaneously refiled, this time listing the Clark County sheriff, the Spokane police chief and the director of the state Department of Licensing as defendants. The sheriffs claim the law is unconstitutional, but most have been vague about which parts of the law they object to and which parts they will not enforce. The main responsibility for local law enforcement under the new law is to run the enhanced background checks — searching at least three state and federal databases and checking for outstanding warrants and pending criminal charges. It is this aspect of the law, which local law enforcement has performed for years on anyone who tries to buy a handgun, that Ferguson said he is most concerned about. 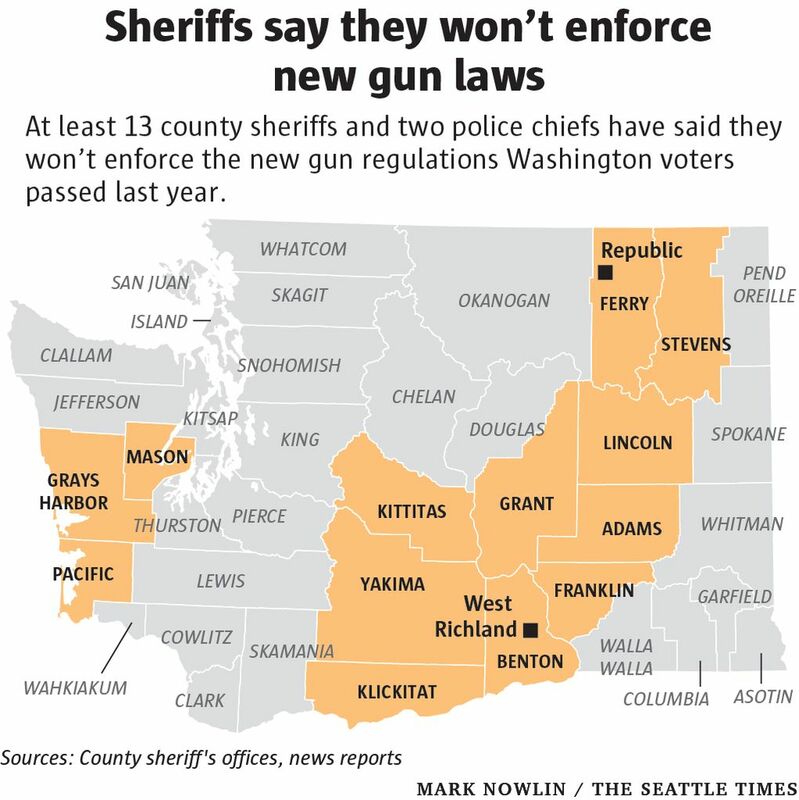 It is unclear how many of the sheriffs and police chiefs who have vowed not to enforce the law planned to not conduct the background checks. For instance, Franklin County Sheriff Jim Raymond called the law unconstitutional and said he wouldn’t enforce it, but said he supported the 10-day waiting period and the enhanced background checks. “Certainly we’re going to follow all of those type of things,” Raymond said. If other sheriffs do not, however, Ferguson said they could be held liable if a gun sale that would have been prevented by the new background checks goes through and then someone uses that gun in a crime. “The taxpayers of your city or county assume the financial risk of your decision to impose your personal views over the law,” he wrote. Brionna Aho, a Ferguson spokeswoman, said Ferguson’s letter refers to potential civil lawsuits, not criminal charges, against sheriffs who don’t enforce the law. “Liability would come in the form of a tort lawsuit from individual(s) harmed as a result of a sheriff or police chief refusing to comply with his or her legal obligation,” Aho wrote in an email. In defending their refusal to enforce the new law, several sheriffs have cited Seattle and other “sanctuary cities” that have promised to limit local involvement with immigration enforcement.